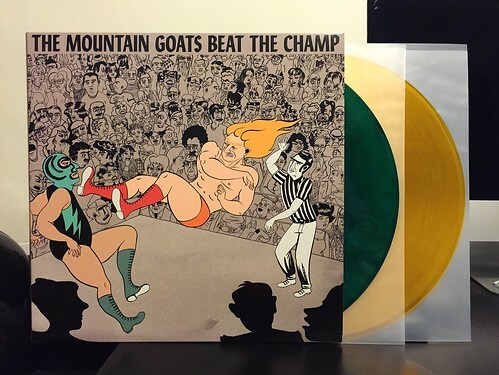 I've always kind of liked The Mountain Goats, harkening back to their early days when I knew them mostly from Shrimper catalogs or as part of the mid 90's tape label scene that I briefly dipped my toe in back then. I can't say I was ever a big fan and never actually picked up any of their records. When I heard they were going to do an entire record about professional wrestling I was immediately intrigued. If you know me, or even if you follow me on Twitter you probably realize that in addition to collecting records and collecting toys, watching pro wrestling is one of my big three pastimes. I'm not sure what I was expecting when I ordered this record. I can tell you that I was not expecting to love Beat The Champ anywhere near as much as I do. The album focuses on the late 70's and early 80's territorial wrestling scene that has long been bulldozed into obscurity. As such you'll hear songs about Chavo Guererro Sr. ("The Legend Of Chavo Guererro") and Bruiser Brody ("Stabbed To Death Outside San Juan"). Singer John Darnielle has a real gift for telling stories in his songs and all of the scenes and characters that he's describing just leap to life. When he's describing a match in "Choked Out" ("Two hundred dollar take all purse/half-nelson to suplex reverse") I can vividly see the everything he's talking about. The musical arrangement range from bleak and somber to upbeat and full of energy. It all depends on the subject matter being tackled. You could make an argument that this is the best record of the year to date. Worst case scenario it's top three and Beat The Champ is certainly the album I've listened to the most lately. Lyrically, this is absolutely the best record to come out so far this year. Even though the all of the songs are about pro wrestling, they're handled with a respect and reverie that you'll seldom see. I think that this record can be enjoyed whether you enjoy pro wrestling or not, but if you do like it, it's absolutely a mandatory listen.